Signs of the Times: SCARY stuff at the Taiwan Taoyuan International Airport. Hey everybody, I’m sorry I’ve been absent from Travel Oops and neglectful of the WordPress community. In May, I traveled to Vietnam to get more material and mishaps (definitely that was a given — just trying to cross the street in Saigon was comedy.) At any rate, to jump back in, I’m sharing some gems from the Taiwan Taoyuan International Airport. By the way, although I was only in the airport on a layover, I’m sure Taiwan is a lovely place to visit. Sign at arrival gate at the Taipei Airport. Taipei, Taiwan, May 2014. It’s not like I travel with cocaine in my colon, but there is something VERY disconcerting about the above drug trafficking sign nevertheless. Then there are the escape contraptions. 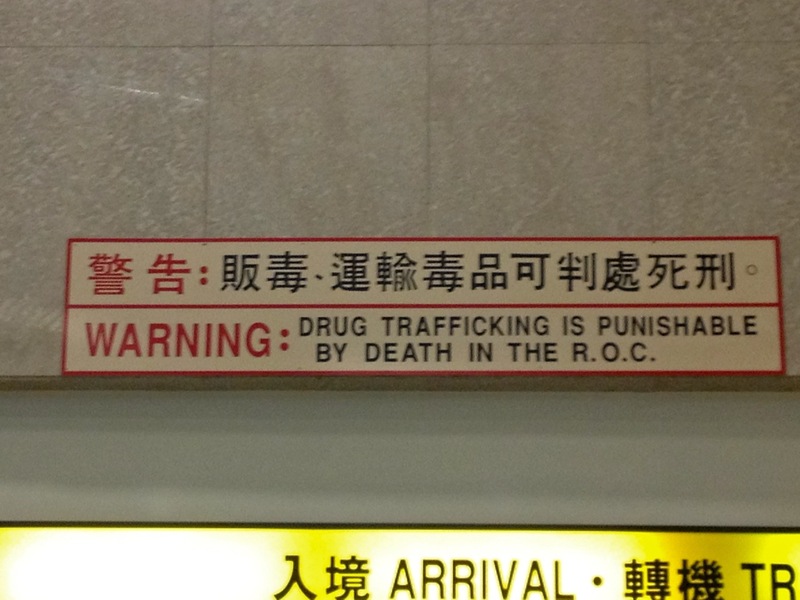 These signs were not comforting, especially since the day before my friend Debbie and I arrived in Taiwan, a massive stabbing spree had taken place in the Taipei metro. I’m curious as to whether these escape routes have been tested. 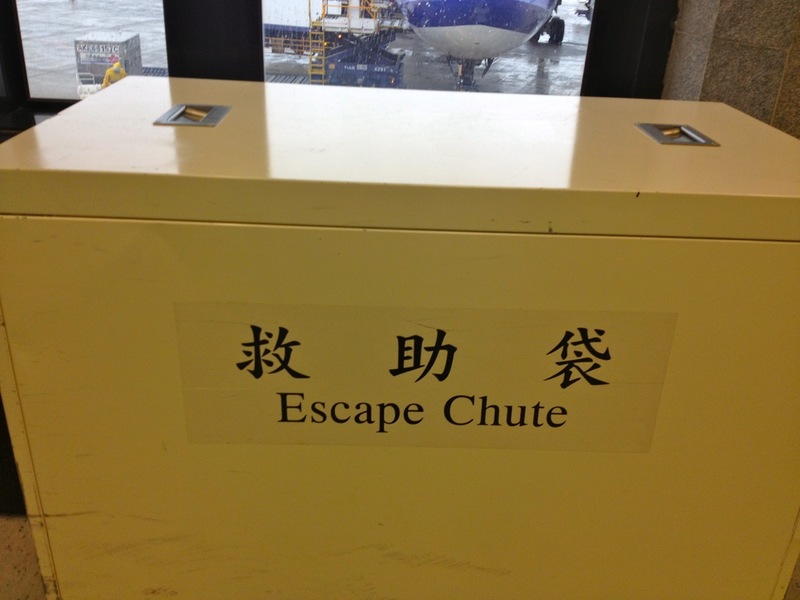 Is this an escape laundry chute? Are your travel frocks that stinky?? 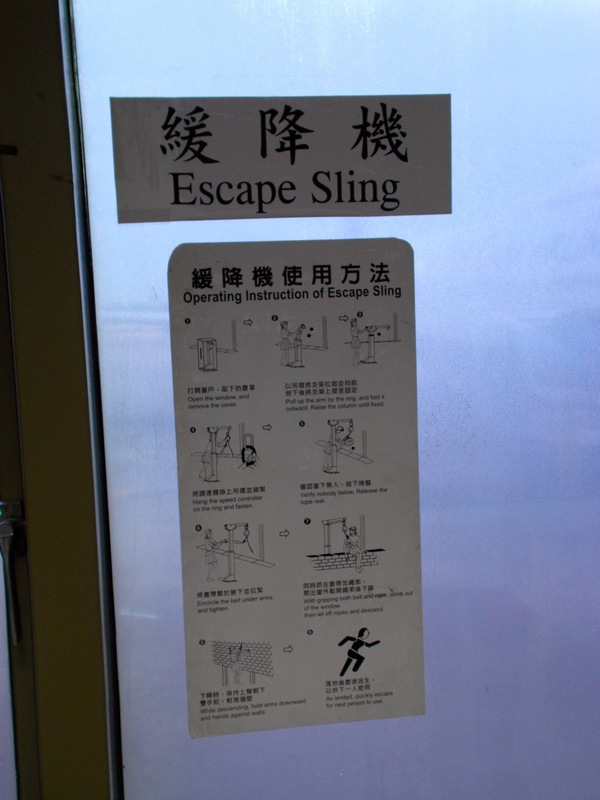 The Escape Sling is definitely intriguing. I wonder what the punishment is for inadvertently using it. Actually, I don’t want to know…..
Indira and I take a break from our sprint to the ferry to look at the Acropolis in the distance. Athens, Greece, 1995. 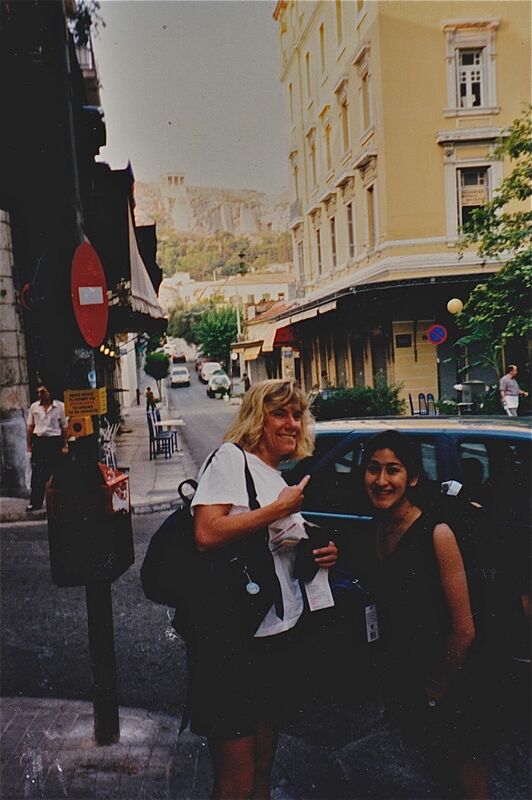 After meeting up with my friend Indira at 3 a.m. in the Athens airport, we slept in a hotel for about 4 hours before getting up to catch a ferry to the Greek islands. Underestimating how long it would take to get to the ferry, we ended up sprinting to the port. However, we took a two-minute break so we could revel in the Acropolis. Two minutes, photo, done. Because we spent all our time island hopping, I never made it back to the Acropolis. So this is my memory. Oh, and it appears that I’m giving the Acropolis “the bird” or maybe just the photographer. Actually, I was pointing with my index finger, but it looks, suspiciously, like my middle finger. 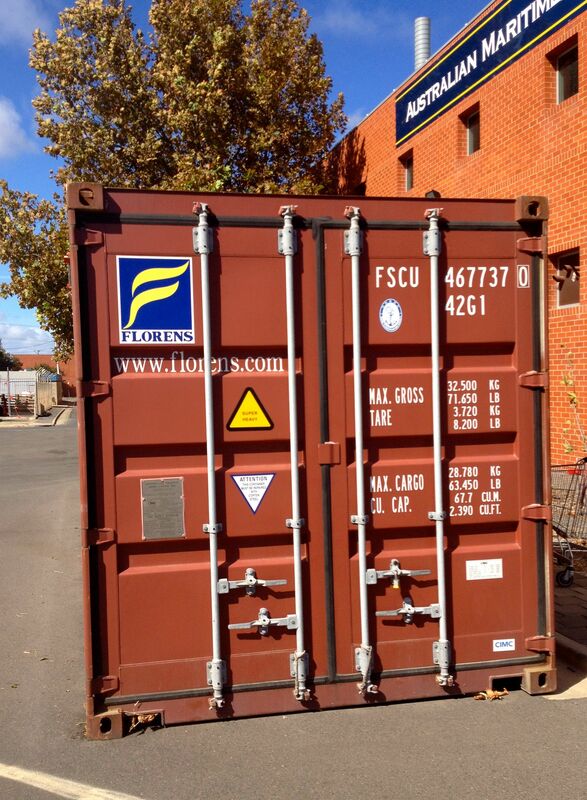 Port Adelaide, South Australia. I’ve found that Australians tell it like it is. 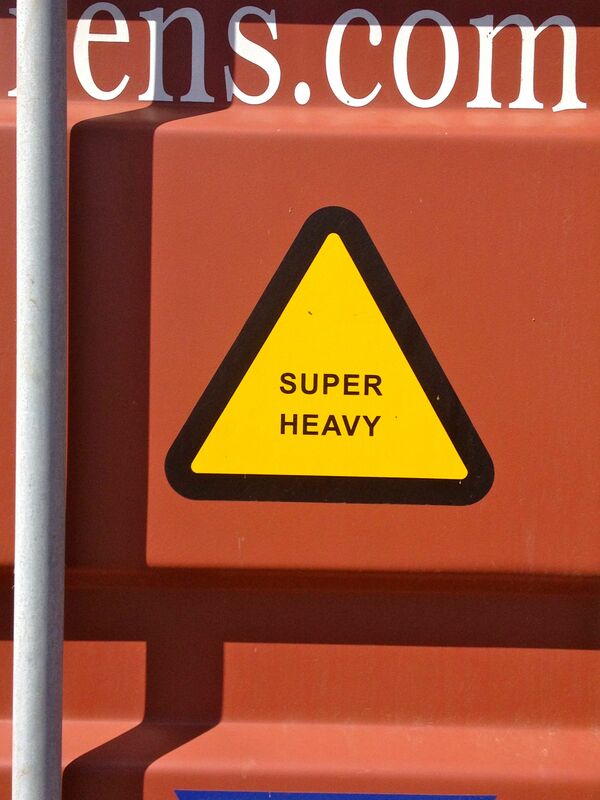 They say what they mean, so better bend your knees and lift from the legs on this one — or get a crane. From Ski Cooper, Colorado: Jazz hands everyone! The Flashy Fall. It seems like in every country, we know that yellow or orange signs signal caution. But that doesn’t mean these signs have to be boring and the same! 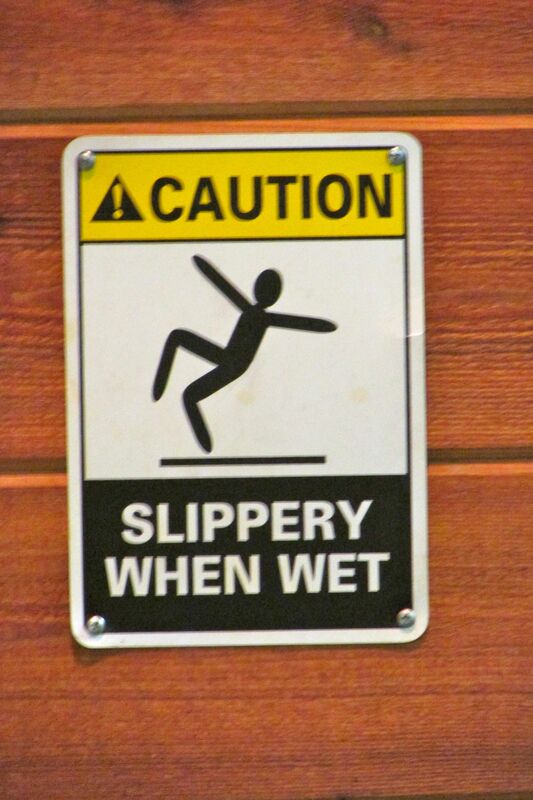 I’ve noticed that “Slippery When Wet” signs vary quite a bit. 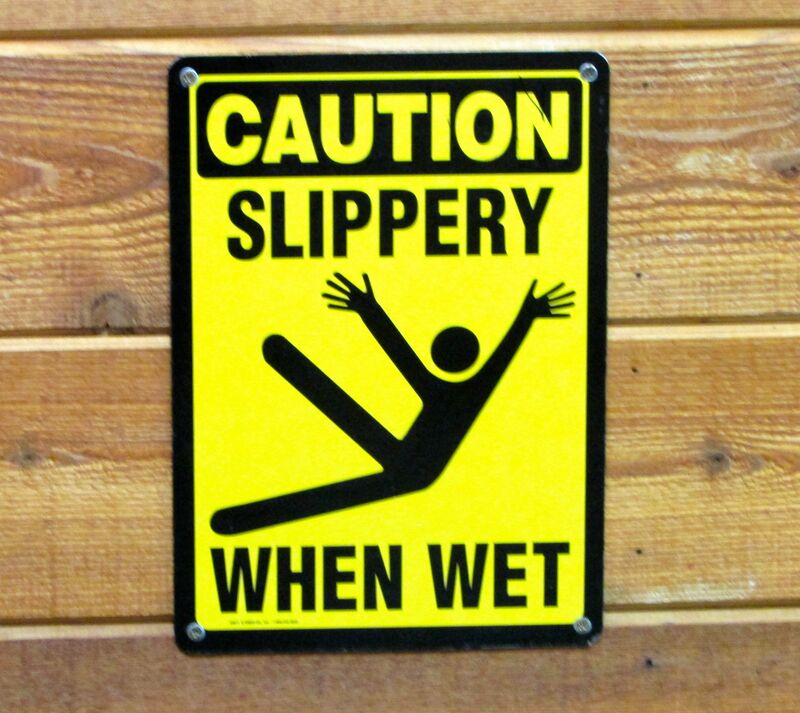 The above sign is my favorite — this guy knows how to slip and land on his bum Broadway Style. Jazz hands everyone! The following photos are part of the Slipping with Style collection. Love the high kick on this one. Time to do the Can Can Save! Signs of the Times: Really “Rustic” or “No-Frills” Yurt? 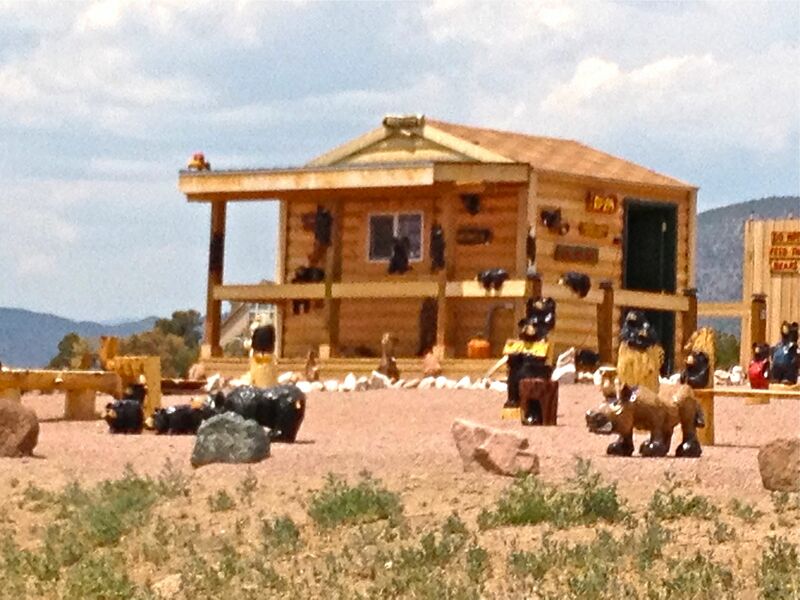 The convenience of cabins off the highway. Along this highway that winds down from a mountain pass on the way to Denver, CO, two signs advertising cabins and lodges show up. 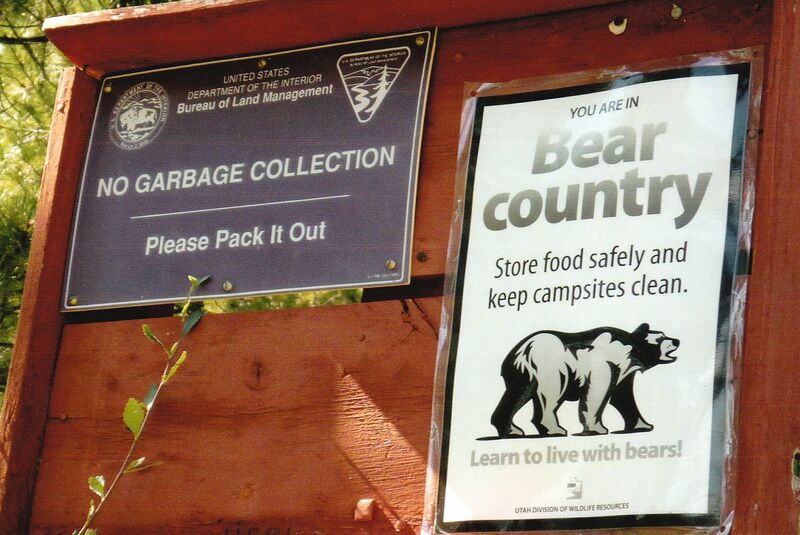 Location is everything, but placement may be more important. 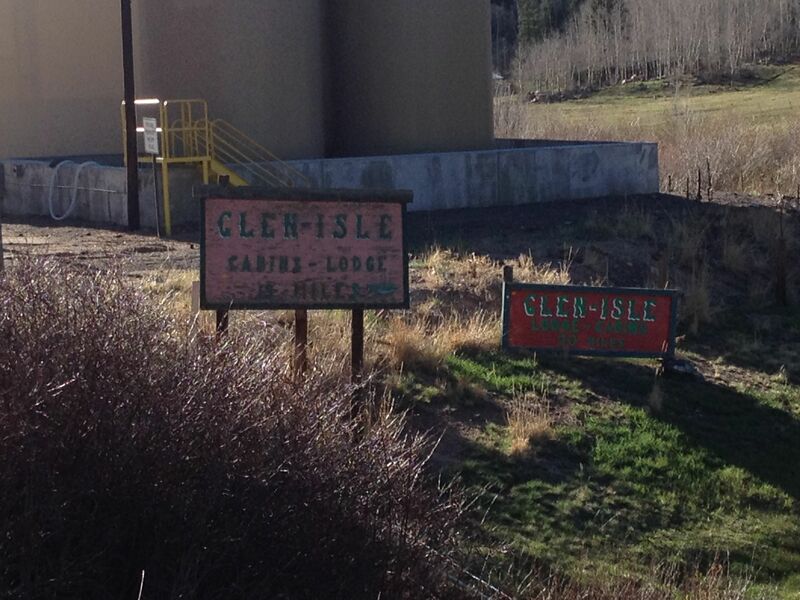 These signs appear right next to a domed pump station. Due to the weathering of the signs, it’s difficult to even see that mileage to the cabins is actually displayed. So, a person who wants that rustic mountain experience may be convinced that the pump station is really some kind of high tech or really no-frills yurt. Sequins have been used for centuries as flair for clothing. In earlier eras they were made out of metal. 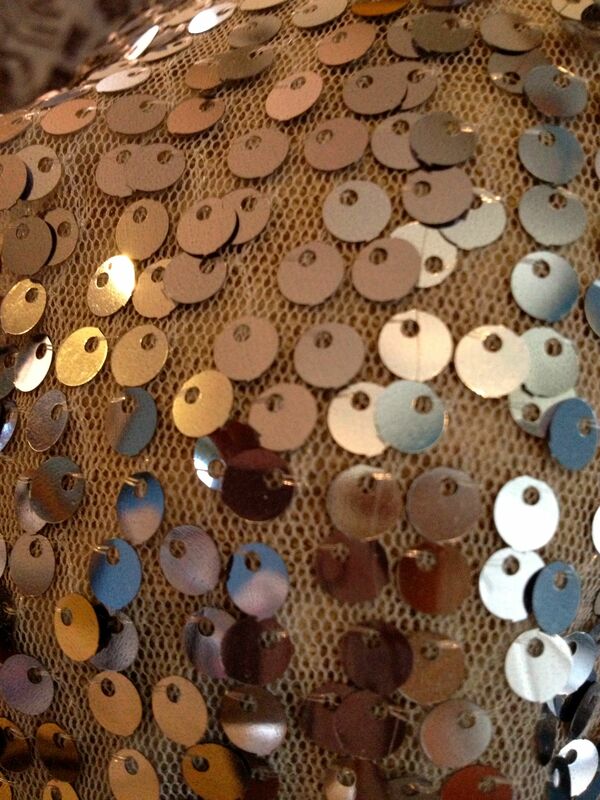 Sequins: the most indestructible flair in fashion. These sparkly plastic disks are surprisingly tough — especially if you get caught on a Drag Queen’s sequined gown in a crowded bar in the Castro District of San Francisco during Halloween. Unwittingly, I volunteered for this sequins durability and strength testing on October 31, 1994. One week earlier, my friend Cathy and her boyfriend Grant invited me to come with them to the Castro for what was sure to the biggest and most outrageous Halloween celebration around. We decided it would be far more exciting than spending the night in Berkeley where we all lived. Halloween is my favorite holiday, and I couldn’t think of a better place to be than the Castro. The Castro’s celebration, essentially a massive street party, was the most popular Halloween event in the nation for decades. Traditionally, Halloween has been a celebration during which many members of the Lesbian, Gay, Bisexual and Transgender (LGBT) community in San Francisco have felt free to be themselves or their alter egos. In San Francisco, Halloween, as a holiday embraced by the city’s LGBT community, has roots dating back to the 1950s. The Tenderloin, North Beach and Polk Street have all been hosts to the blowout. 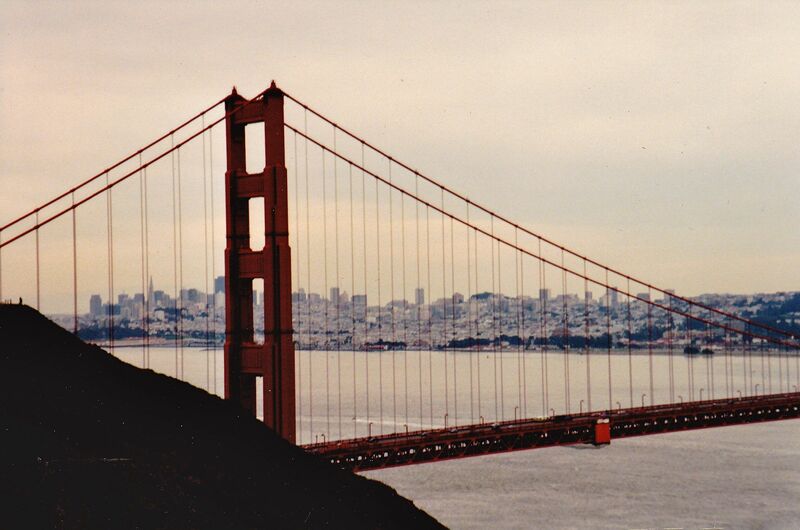 The Castro naturally inherited the celebration when more gay residents moved to the area in the 1970s. It has rivaled Mardi Gras as far as major ragers go. Unfortunately, like all good parties that draw the masses, the Castro’s Halloween celebration ballooned to more than 10,000 participants in the early 2000s. City officials canceled the celebration after a 2006 shooting injured nine revelers. While people still gather in the Castro on Halloween it is nowhere near as epic a celebration. Cathy, Grant, their friend Ally and I arrived in San Francisco around nine o’clock. When we got to the Castro it was a total free for all. Scantily clad guys sprinted down Castro Street while gorgeous drag queens sashayed down what turned into an asphalt catwalk. Public displays of affection abounded. This was a homophobe’s biggest nightmare. For a woman, however, it was awesome. 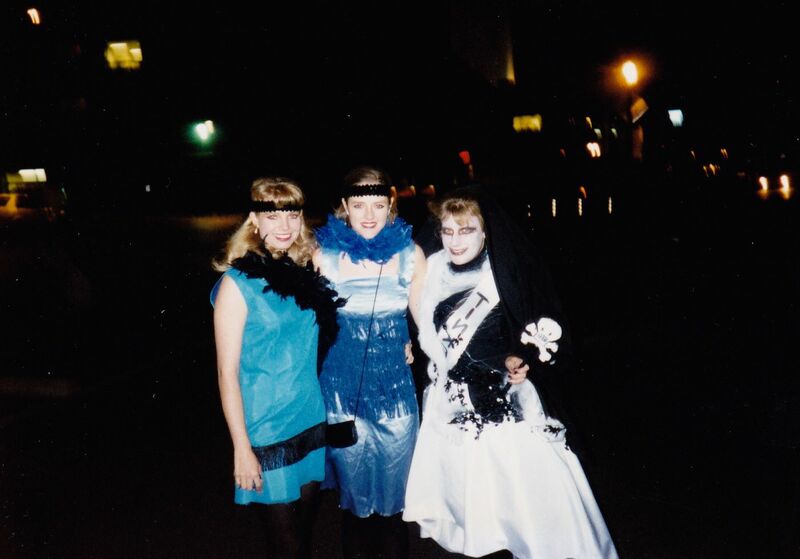 No cat calls, whistles, getting groped or ordered to “Smile.” Cathy and Ally were dressed as sassy flappers, and making use of a former bridesmaid’s dress and lots of black kohl eyeliner, I was “Tinkerhell,” Tinkerbell’s evil Gothic twin. Basically, we could have been naked and on fire and no one would have given us a second look. 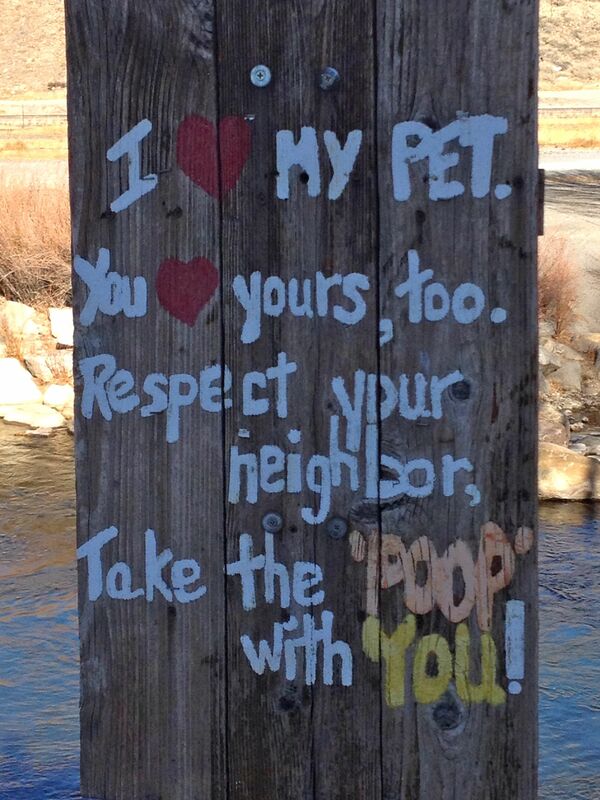 This is sort of the hippie make-love-not-poop (but if you do, it’s okay) sign. Who wants to retrieve tissue from its original manufacturer’s box? Boring. We haven’t seen many advances lately in the tissue and tissue accessory industries — aside from adding lotion and aloe, which was exciting for probably the first two years after the new product was introduced. 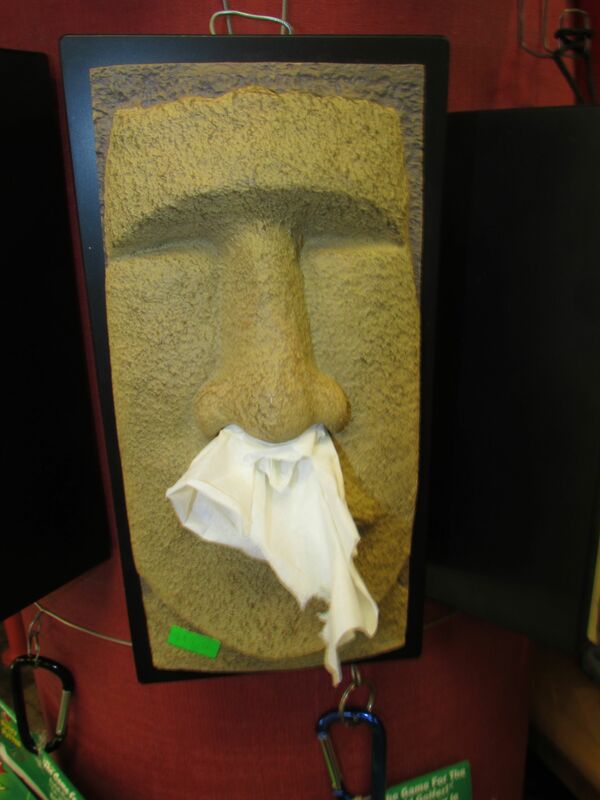 While roaming around in the St. Lawrence Market in Toronto, Canada, I came across these far-from-boring tissue keepers. Signs of the Times: Hey, Audrey — Cut that Crumpet with a Chainsaw! 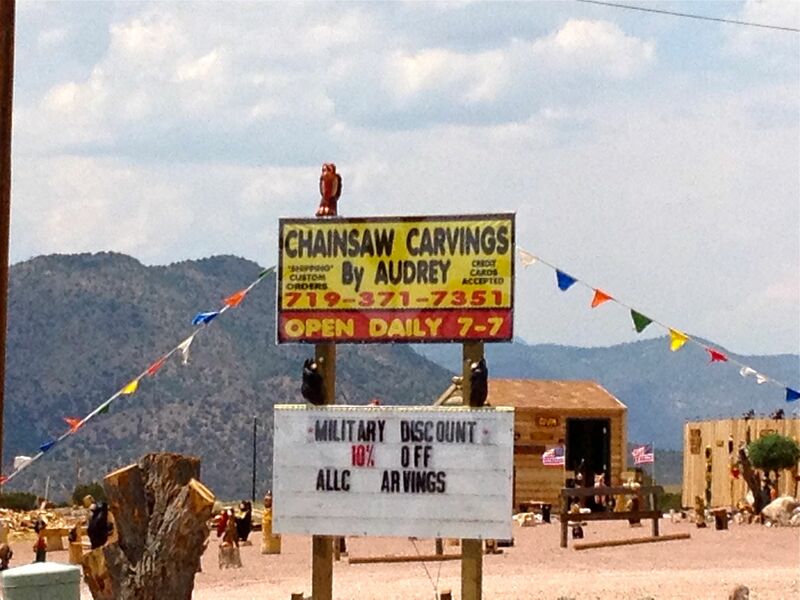 Audrey is good with a chainsaw and good with the troops. All I have to say is that Audrey must be pretty badass. After teaching To Kill a Mockingbird by Harper Lee for 10 years and having an annual “Boo Radley Day” where my students and I carve Ivory soap sculptures with plastic knives, I can only imagine what it must be like to whittle wood with a friggin’ chainsaw. Not to mention that one just doesn’t expect a chainsaw wielding woman to necessarily be named Audrey. I keep thinking Audrey Hepburn and cutting a crumpet for breakfast with a chainsaw at Tiffany’s just seems a bit off. By the way, I’m not saying Chainsaw Audrey isn’t as elegant as Audrey Hepburn. 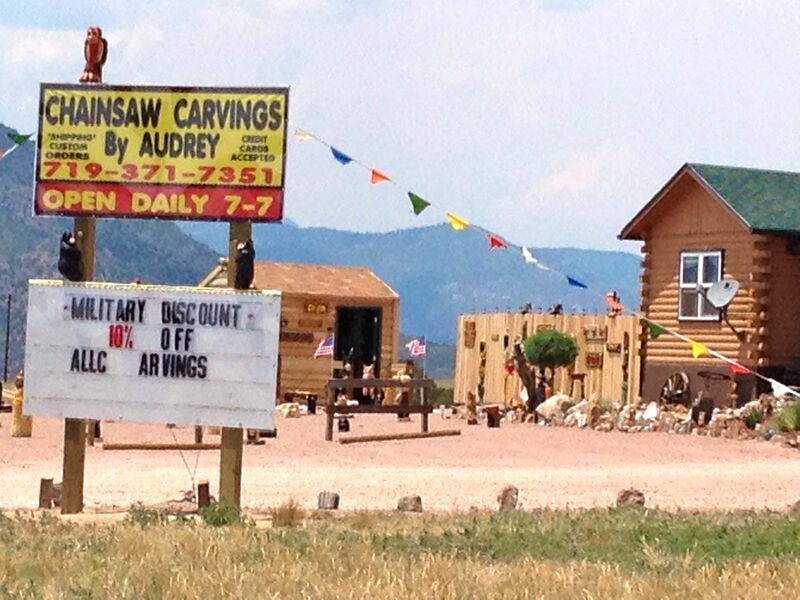 At any rate, Chainsaw Audrey is darn impressive with her creations.